Next to red, white, and blue, green and yellow might be the most iconic color combination in America. All across the country, though particularly in the South, folks have John Deere lawnmowers parked in their garages, John Deere tractors stored in their barns, and of course John Deere hats fitted on their heads. It is totally normal for a kid to learn to drive a Deere well before they get behind the wheel of a car – and that probably explains why our friend really wanted our help setting up a John Deere candy buffet for her son’s birthday. After all, what could a kid possibly want more than a party full of chocolate and tractors? If you’re a regular reader of the CandyStore.com blog then you know that we’re not ones to shy away from creating a cool candy buffet. As far as requests go, though, this was definitely a first for us. It took a lot of creativity, a lot of hard work and more than a little help to put this spread together, but in the end we think we were able to put together a John Deere Candy Buffet that would make the Green and Yellow proud. Check it out. As you might guess, it wasn’t hard to pick out the colors of this particular candy buffet candy. And it just so happened that we had plenty of green and yellow candy on hand. 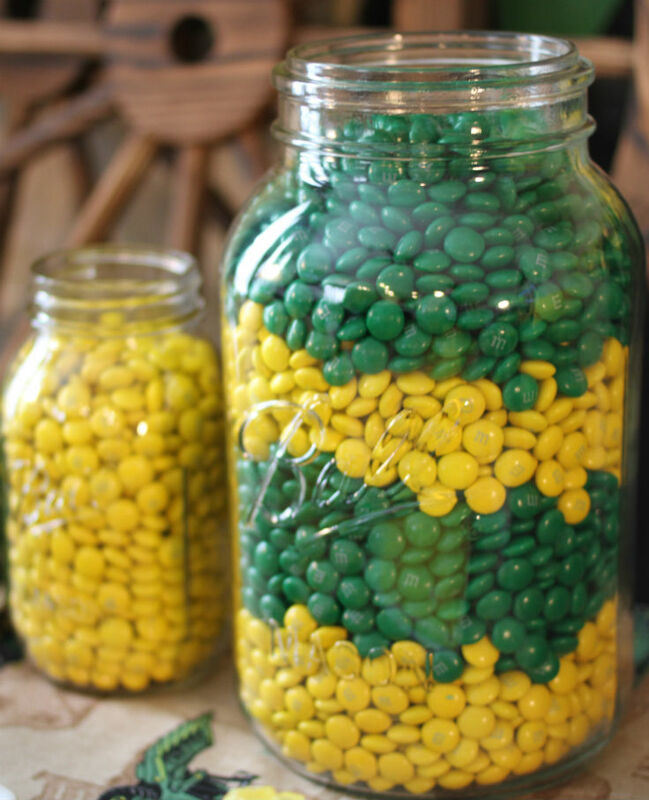 We filled various mason jars with green and yellow M&Ms to give the buffet that good old country feel. They were complemented with a jar of green rock candy sticks and a tray of yellow rock candy strings. We filled the spread out with a jar of yellow jelly beans. Of course, any party planner worth their streamers knows that you can’t expect to sustain kids on pure candy alone. There have to be other delectable treats in the mix as well. We started things off by making some “Hay Bales” out Captain Crunch and marshmallows. Are they really just knockoff Rice Krispy Treats? Maybe, but why don’t we just try to suspend that adult cynicism for a moment. We also picked out some cupcakes and a cake from the bakery at our local HEB. If you aren’t familiar, HEB is a fairly large grocery chain here in Texas that specializes in sourcing food from local suppliers. It is awesome and yes, you should totally visit one the next time you’re in the Lone Star State. Actual John Deere tractors are easy to find around here, but John Deere party accoutrements are not. So we had to turn to the Internet to help us make this buffet shine. Specifically, we purchased a John Deere flag banner and some Deere Cap cupcake toppers from Amazon. And of course, the John Deere truck, which we “borrowed” from the birthday boy. The table cloth we’re using is actually some cool tractor-themed fabric that we found at a local craft store. Finally, we rounded off the whole rustic-tractor theme by featuring some weathered wagon wheels that we borrowed from the birthday boy’s mother. In the end, the John Deere Candy Buffet ended up being a huge hit with all of the guests – kids, parents and one particularly misbehaved Labrador – who attended the party. Cupcakes were eaten, rock candy strings were transformed into sticky makeshift bracelets, toy tractors were played with and good times were had by all. And yes, the dog was fine. Not to prime our own engines, but we did a pretty good job with this one. So if you’re looking for a cool candy buffet to feature at your next country-themed kid’s party, feel free to use this Deere-inspired spread as an inspiration. It’s simple to build, inexpensive to supply, easy to modify and super fun to devour. Also, feel free to use the pictures we’ve featured here for your Pinspiration boards and other social galleries. We built this thing for you guys and we’d be doing the Deere wrong if we didn’t encourage you to share it. And make sure to stop by next week for even more awesome candy creations, recipes and inspiring buffets!